In the last article, I discussed Rick Simpson and <phoenixtears.ca> who help spread the message of a cannabis cure for cancer, through the internet, to anybody willing to take the necessary risks. Although Rick has appeared on the scene fairly recently, and his work is a modern revelation, the technique he uses has been well known for some time. Otherwise known as “honey oil,” this process concentrates the cannabinoids by slowly reducing the plant matter in a solvent solution (i.e. alcohol). Honey oil is commonly smoked in a pipe on a bed of ashes or smeared across a rolling paper, producing a powerful impact that can last many hours. The Rick Simpson revelation was that to treat serious medical conditions, you have to eat this gooey extract or apply it directly to the skin. In an ongoing attempt to provide products for the diverse needs of their membership, medical dispensaries are exploring the many possible ways to help your cannabis digest—from tinctures and pills to drinks, incense and essential oils. The exploration of medical cannabis products is an ancient art making a rapid comeback in our day. In the late nineteenth century, Cannabis tinctures were widely prescribed for analgesic, sedative, and narcotic purposes: “It was used as the primary pain reliever until the invention of aspirin”[i]. Sativex is a sublingual cannabis tincture spray produced in England by Bayer Pharmaceuticals. It’s now available by prescription in Canada for MS, neuropathic pain, and as an adjunctive treatment for cancer patients. A nearly identical product produced by the VICS (Vancouver Island Compassion Society) called “Cannamist” has been available for years, as the simple procedure of soaking cannabis in alcohol is well known. A spray or drop of tincture under the tongue will absorb quickly into the bloodstream, so one can monitor very closely the adequate dose. Glycerin can be substituted if the alcohol is undesired. Heating cannabis rich alcohol reduces and concentrates the cannabinoids into “honey” or “hash” oil while evaporating the solvent. A well ventilated area is necessary, as the gases released will be highly flammable and a single spark can be devastating. Some dispensaries use concentrated oils like “budder” to medicate their selection of edible products. As part of a verbal agreement with the Capital Health Region, the CBC of C cannot use methods that include flammable solvents and produce combustible fumes. Until we obtain a license to produce in a commercial space, honey oil products will remain unavailable to our members. So, instead we have focused on vegetable oil infusions that offer their own wide range of benefits. 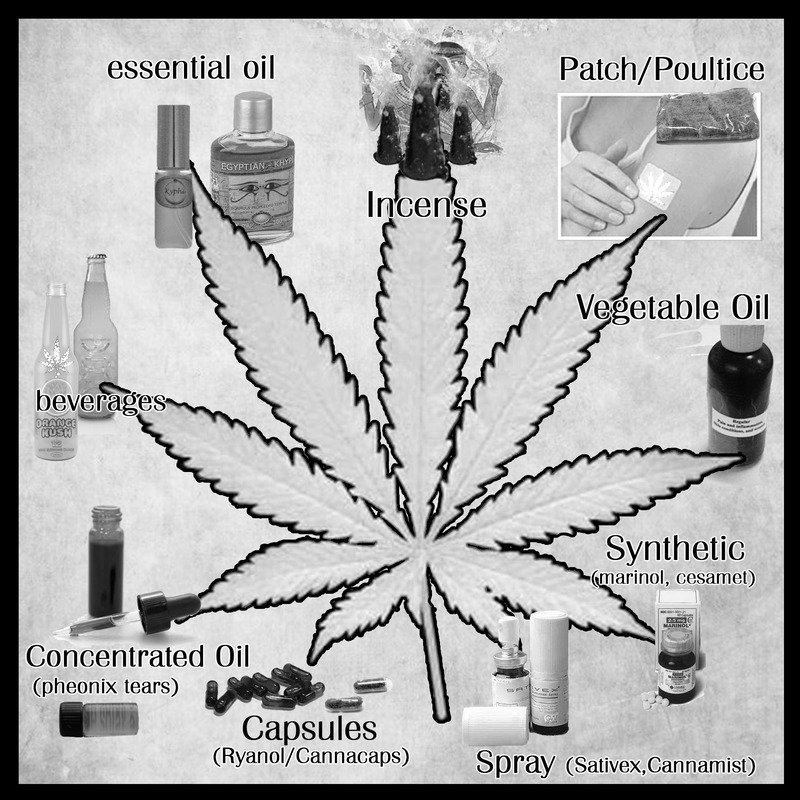 The medicinal benefits of the vegetable oil base are an adjunctive to the cannabis treatment. Olive oil is high in Omega 6 fatty acids. In western societies there is an imbalance in the oil consumption in our diets with a general need to increase the level of omega 6 and 3 fatty acids. Olive oil’s mono-saturated chemical structure allows for the greatest stability at room temperatures[ii]. Mono-unsaturated fat is a healthier type of fat that can lower your risk of heart disease by reducing the total “bad” cholesterol levels in your blood; balancing blood sugar and blood pressure. Olive oil saturates the cells as it carries the cannabinoids across the skin or stomach lining. Extra virgin olive oil is preferably used fresh and stored away from light, air, and heat. Grape seed oil is high in essential fatty acids. Your body cannot produce them, so they must come from the foods you eat. The EFAs in food are sacrificed along with the B vitamins and the naturally occurring enzymes to enable extended shelf life in the supermarket. This is a major problem since EFAs are the building blocks for a healthy immune system. “Hemp seed oil has […] a perfectly balanced 3:1 ratio of Omega 6 (linolei/LA) to Omega 3 (alpha-linolenic/LNA) EFAs determined to be the optimum requirement for long-term healthy human nutrition. [iii]” It’s unfortunately expensive, given limited production, preventing us (and others) from using it. A number of people are allergic to nuts and nut oils, including their use topically, which deters the CBC of C from using coconut or almond oils that are otherwise healthy alternatives as a base. Honey provides a natural preservative base rich in nutrients and minerals. Honey can be infused in a double boiler on low heat, allowing the honey to cool before reheating and repeating this process for up to 3 days before straining out the plant material. Other natural preservative sweeteners like agave and maple syrup can also be infused with dry kief hash, and used as the medicinal ingredient in tea or soft drinks. The efforts of Colorado based companies DixieElixers and Canna Cola to rigorously test for quality control and standardized doses of THC are breaking new ground with the intention of providing to dispensaries across the United States. They currently make 12oz. fizzy fruit drinks containing about 22-35 mg of THC at the cost of $10 a pop. Cannabis drinks have been popular for tens of thousands of years. Historian Chris Bennett traces the techniques for making the Vedic Soma and Persian Haoma in his most recent book, Cannabis and the Soma Solution. Chris uses archaeological and etymological evidence to illuminate cannabis as a consistent ingredient in ritual beverages—techniques advancing from ancient times when the oil from the seeded flowers of wild cannabis were crushed and pressed after becoming enriched with the oil soluble cannabinoids, to advanced techniques for cultivating feminine cannabis and extracting the cannabinoids into forms of hashish. It is still common in Egypt to use steam distillation to produce a cannabis flower essential oil rich with therapeutic terpenes as a scent for perfumes, cosmetics, soaps, and candles, and to add sweetness to baked goods and candies. Although the varieties of cannabis used in today’s products are low THC, this method could be applied to medicinal grade cannabis. The essential oil is anti-fungal and can also be mixed with water and sprayed onto plants for protection. All of these options may seem to be becoming further from our most familiar method of medical delivery, the pill. However, many dispensaries provide oil filled capsules and some dry herb “Cannacaps” in an attempt to mimic the standard pill. Marinol or Dronabinol, available by prescription, is synthetic THC dissolved in sesame oil: “a 5 mg. capsule contains iron oxide red and iron oxide black, gelatin, glycerin, sesame oil, and titanium dioxide”[v]. With great variation in plant material it’s difficult to produce a standardized medical cannabis product. Genovations Creations in Colorado Springs use a forced ventilation oven (maintaining 35˚ temperature to evaporate any moisture); a Vortexer to stir the cannabinoids in the solvent; and a Sonicator that breaks open the trichomes in the test tube by vibrating sound waves through the water the test tube is submerged in. This ensures the material is evenly dispersed before testing with a HPLC to standardize and quantify doses. They currently produce interesting new products for the skin combining hash oil and essential oils into bubble bath and shower gel. Recently, Medical Marijuana Delivery Systems, based in Europe, acquired patent rights for a topical medical marijuana patch. Similar to a nicotine patch applied to the skin, it releases cannabinoids into the intercellular lipid layer surrounding the cells of the outer level of the skin, rather than through the cells themselves. It’s being sold worldwide as “a holistic, therapeutic adjunctive for management of chronic pain […] and other chronic conditions.” Working with a member of the Santa Ana Pueblo Tribe of New Mexico, MMDS plans to market “other new delivery systems like creams, gels and oils to people and animals in need”[vi]. Some dispensaries have started using DMSO in their topical medications. DMSO is a byproduct of the pulp and paper manufacturing industry, predominantly used as a vehicle for topical application of pharmaceuticals. It is frequently compounded with anti-fungal medications, enabling them to penetrate, not just skin, but also toe and fingernails. Extra caution is required when using DMSO, as any toxins on your skin or on any of the equipment you are using will be allowed to enter your body as well. Infections may occur where special care isn’t paid to ensure sanitary conditions. Witnessing the advancements in the medical cannabis field is a source of endless inspiration. There is so much more to this creative healing art than just cookies or the proverbial brownie. I am scheduled to appear in court for a preliminary trial on May 19 and 20, regarding my part in providing vegetable oil based cannabis foods and massage oils for members of the CBC of C, in Victoria. While I stand charged with possession for the purpose of trafficking THC, Bayer Pharmaceuticals is shipping THC worldwide in Sativex bottles. Regardless of the outcome of my trial, the medical cannabis movement will continue to grow rapidly, learning from each other to provide the highest standard of treatment we can offer. [i] “History of Cannabis”. BBC News. 2 November 2001. http://news.bbc.co.uk/1/hi/programmes/panorama/1632726.stm.